Bruce Silverstein is pleased to announce our representation of Penelope Umbrico and her inaugural exhibition at the gallery. 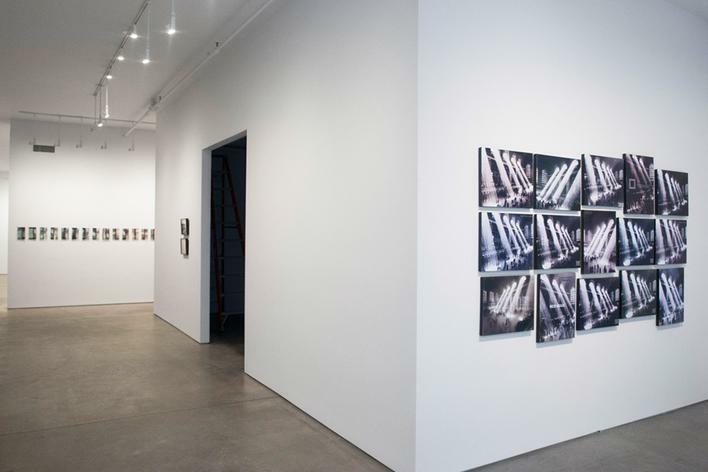 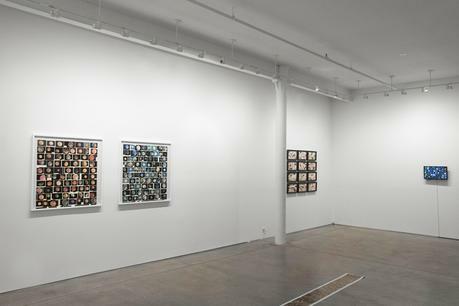 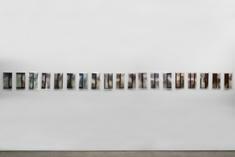 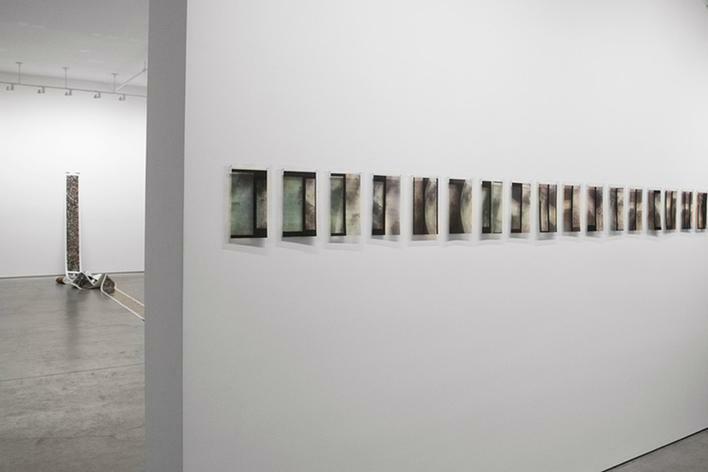 For Silvery Light, Umbrico creates an installation of new photographic and video works related to her continued practice of utilizing the limitless archive of photographic images online. 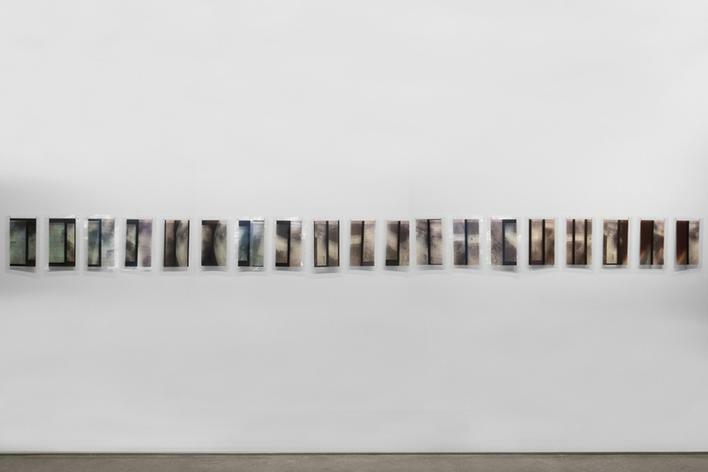 This new work investigates projective and reflective light in relation to the history of photography, digital imaging technologies, and the screen as light source. 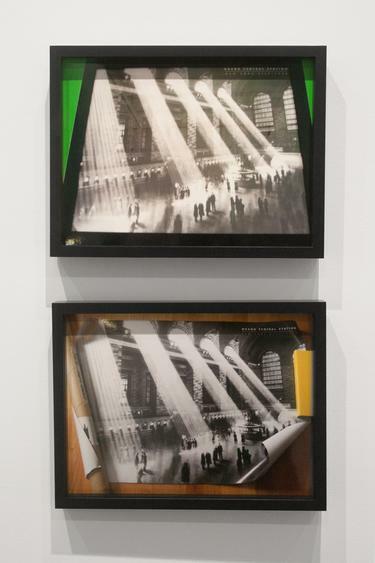 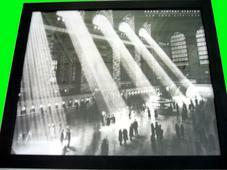 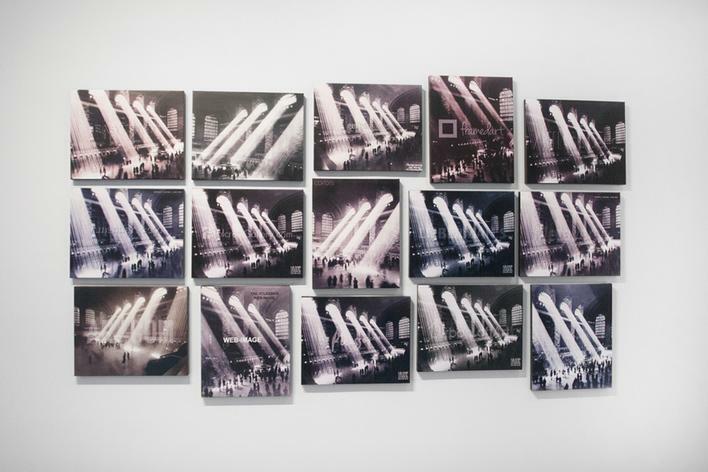 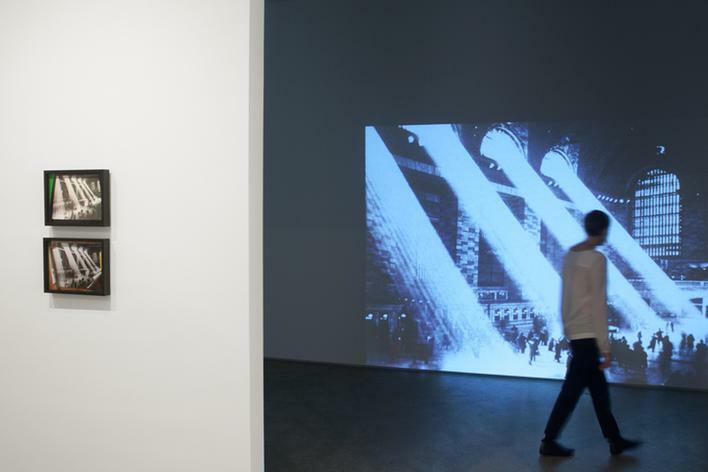 In the front gallery, Umbrico has installed the video piece Four Photographs of Rays of Sunlight in Grand Central…, a collection of hundreds of iterations the artist found online of the iconic black and white photograph of sun rays through windows at Grand Central Station. 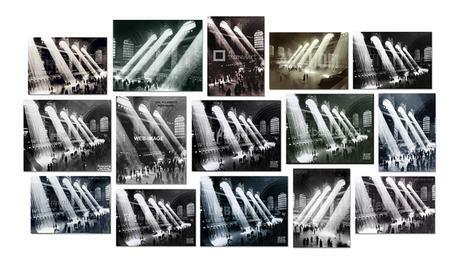 Umbrico identified four versions of this original image of Grand Central Station, repeated over multiple websites selling the images as posters or vintage prints, treated with different color filters, cropping, and “watermarks.” For each of these images she attempts to find the attribution, which, on these sites, is as varied as the aesthetic treatments to which the images have been subjected. 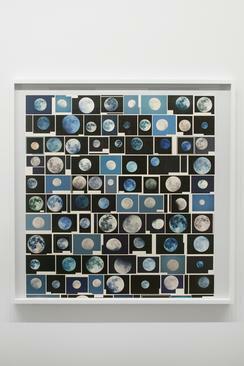 In the back gallery, Umbrico turns to the photo-sharing website Flickr to explore how the full moon is photographed and shared. 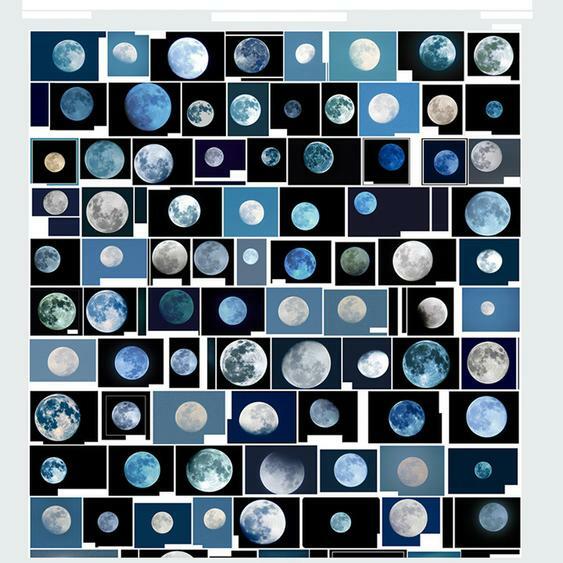 Everyone’s Photos Any License; Screenshot 2015-11-04 14.22.59 is a screenshot from her computer of every image tagged “full moon” on Flickr (1,146,034 images total), which Umbrico produced as a single print running the length of the gallery. 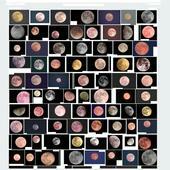 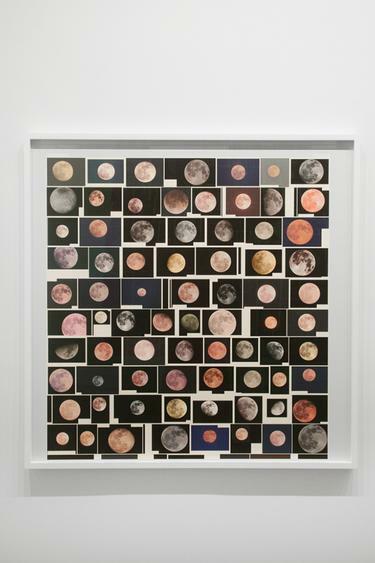 The individual subjective experience of witnessing and photographing the moon is revealed as a collective practice, seen re-contextualized in its entirety, with new impact and effect. 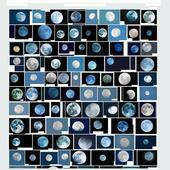 Flickr is also the resource for Umbrico’s well-known work, Suns from Sunsets from Flickr (2006-ongoing), which addresses the ubiquity of amateur sunset photographs uploaded to the photo-sharing website. 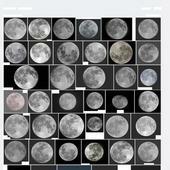 Her latest project, Everyone’s Photos Any License, looks at a similar photographic cliché: photos of a full moon. 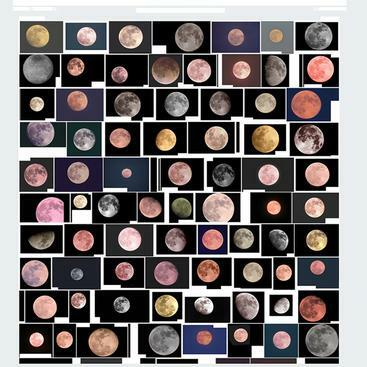 Taking a clear photograph of the moon requires slightly more expertise and specialized photographic equipment than a snapshot of the sunset (a smartphone won’t do). 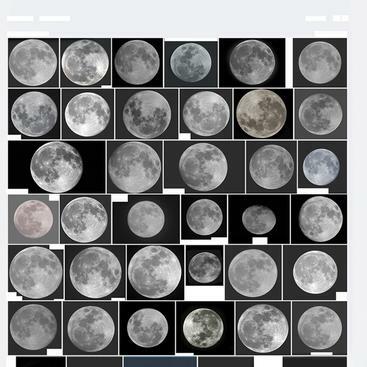 However, Umbrico discovered there are over one million nearly identical, technically proficient images of the full moon on Flickr, and thousands of these images are copyrighted by Flickr users. 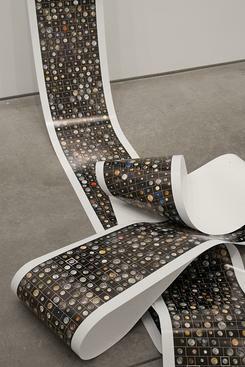 The irony of this compelled Umbrico to focus on those photographs with the ‘All Rights Reserved’ license and to seek permission from 600 photographers to use their photographs in her installation. 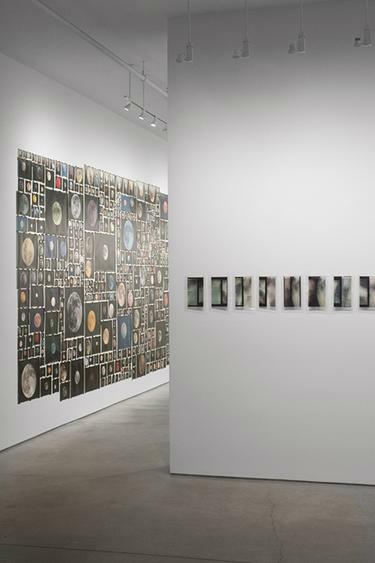 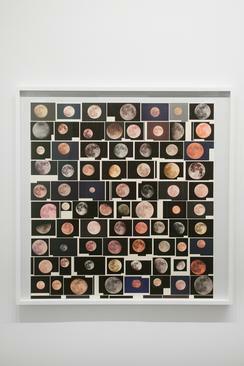 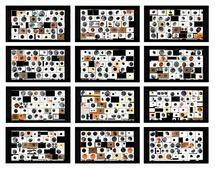 The result, Everyone’s Photos Any License (654 of 1,146,034 Full Moons on Flickr, November 2015), is comprised of each of these photographs individually printed and mounted to the wall. 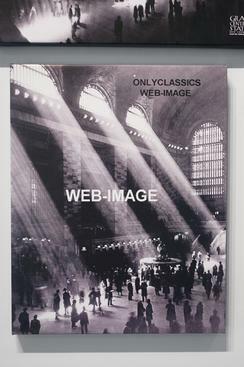 The work is accompanied by a multi-page attribution text, Credits, compiling the names, credit line, image title, and licensing terms for each photographer, and any technical details about the image that the photographer provided on Flickr. 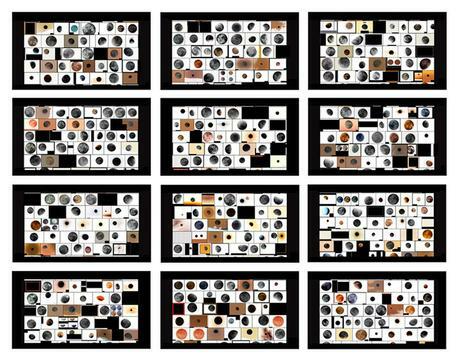 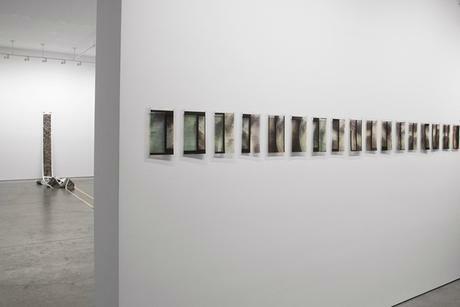 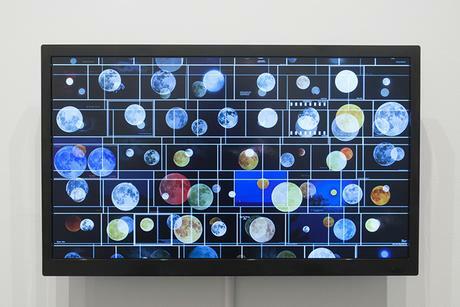 Also in the exhibition are a series of screen captures Umbrico made while producing Everyone’s Photos Any License. Screenshot 2015-11-07 18.34.11 / Pink Filter and Screenshot 2015-11-24 18.14.32 / Blue Filter utilize Flickr’s color search filters. 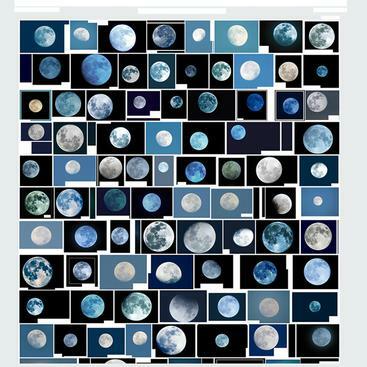 For Screenshot 2015-11-24 / Dark as Light, Umbrico inverted the image files, producing tones and hues associated with analog film negatives. 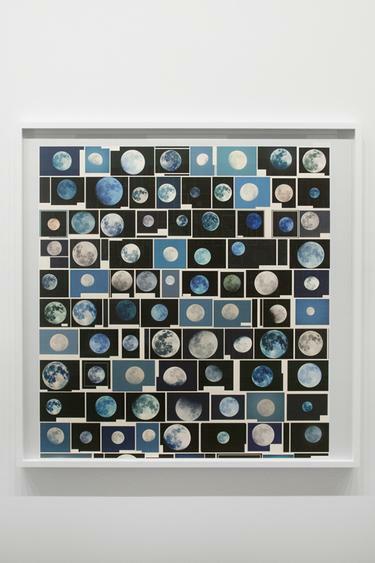 In this work, night becomes white, the moon becomes dark, and the white of the screen is represented by black ink on paper. 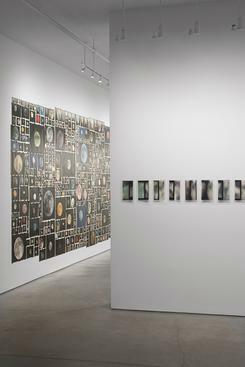 Another inversion occurs in the work hanging between the front and back galleries. 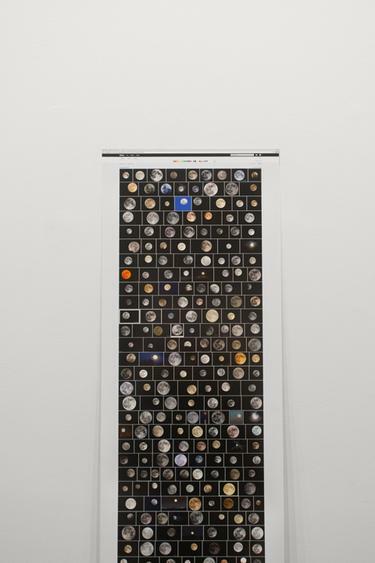 Umbrico points her iPhone at Google Moon on her computer screen, making ‘subjective’ images from Google’s composited NASA photographs. In this work, screen resolution, pixel grid, and camera sensor conflict, creating Moiré patterns that interject into the already compromised representation of the moon. 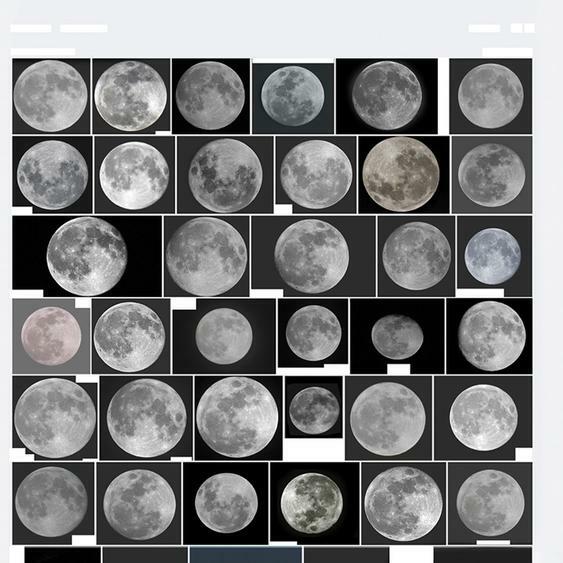 Umbrico further troubles this representation by making screen captures of her iPhone’s ‘camera roll,’ eclipsing the images of the moon with the framing structure of the iPhone’s interface. 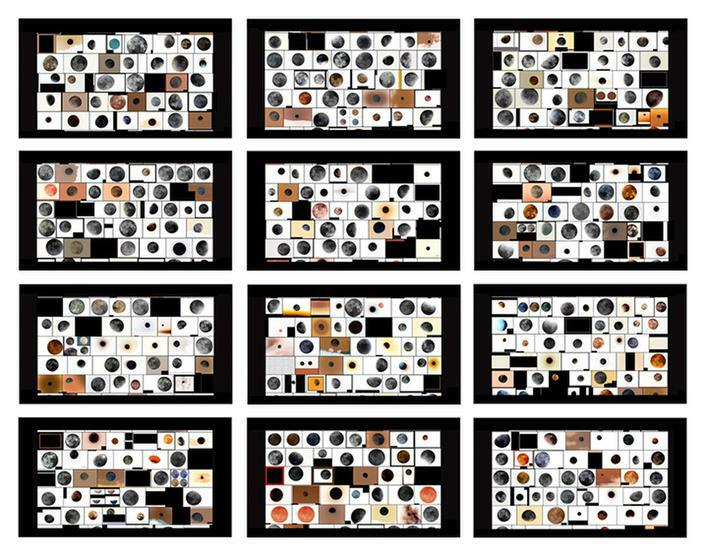 Made entirely in and between screens, the resulting images reference scientific studies, but are only the results of the digital idiosyncrasies of common imaging technologies. 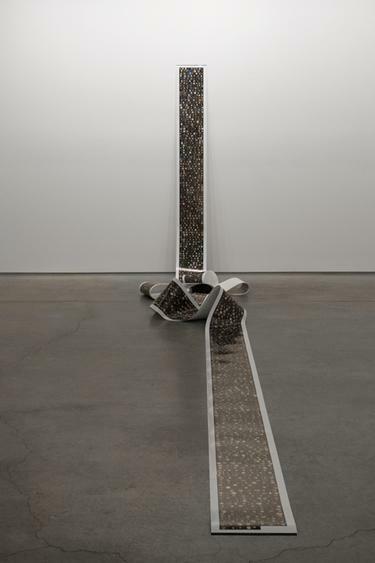 In 2016, Penelope Umbrico will have a solo exhibition at the Milwaukee Art Museum, WI. 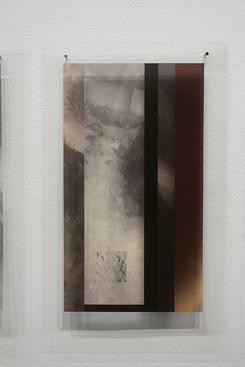 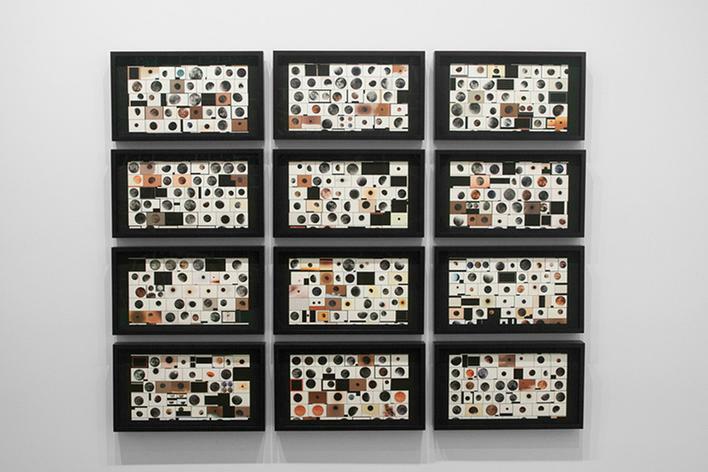 Her work was recently featured in a solo show at the Aldrich Museum, CT, and has been included in exhibitions worldwide. 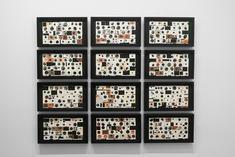 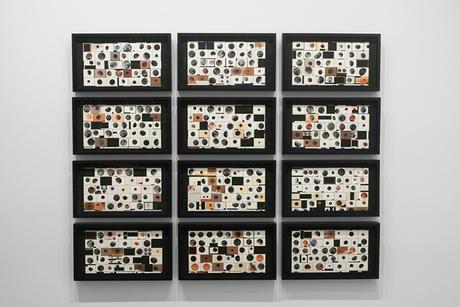 Umbrico's work is represented in numerous museum collections, including the Guggenheim Museum, NY; Los Angeles County Museum of Art, CA; Metropolitan Museum of Art, NY; Minneapolis Institute of Art, MN; Museum of Contemporary Art, San Diego, CA; Museum of Modern Art, New York, NY; Perez Art Museum Miami, FL; San Francisco Museum of Modern Art, CA; and the Berkeley Museum of Art, CA. 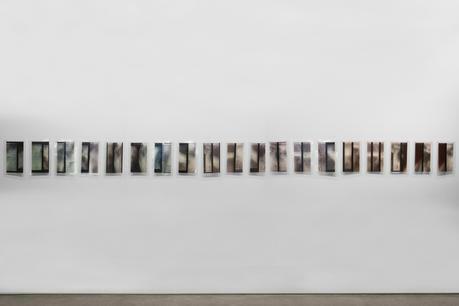 She is the recipient of a Smithsonian Artist Research Fellowship, a Guggenheim Fellowship, a John Gutmann Photography Fellowship Award, a Deutsche Bank Fellow/New York Foundation of the Arts Fellowship, a Peter S. Reed Grant, an Anonymous Was A Woman Award, and an Aaron Siskind Individual Photographer’s Fellowship.